March 4, 2019, Adrian, Michigan – The City of Adrian and Lenawee County face a number of challenges. But given the community’s assets – such as caring people and about 800 nonprofit organizations – the community can face those challenges, particularly by building on collaboration already in place among service agencies. 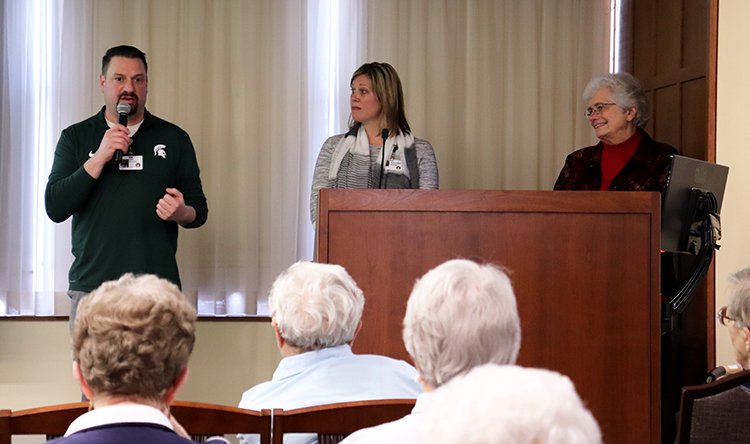 Joel Henricks speaks about Share the Warmth, a homeless shelter in Adrian, while Co-chairs Jennifer Hunter, center, and Sister Sharon Weber, OP, listen. The Congregation spent a year studying resilient communities and shared some of the findings during a public symposium in March 2018 and an educational forum in August 2018. Committees have been formed in Adrian and in the Congregation’s Dominican Midwest, Dominican West, Florida, and Great Lakes Mission Chapters to explore opportunities to build resilience in their regions. Jennifer Hunter and Sister Sharon Weber, OP, Co-Chairs of the Adrian Resilient Communities Committee, focused their February 25 update on the results of the Committee’s year of research and next steps in collaborating with people of Lenawee County. Seated in the front row, from left, are some members of the Adrian Resilient Communities Committee, Sister Maurine Barzantni, OP, and Co-workers Joel Henricks, Director of Facilities and Grounds; Brad McCullar, Director of Technology; Amy Palmer, Director of Development; Associate Dee Joyner, Director of the Office of Resilient Communities; and Kris Cooper, Executive Assistant for the Office of Resilient Communities. Jennifer, Campus Administrator, reported on the statistics that the committee had unearthed: Adrian’s population of 20,000 in a county of 98,000 residents; the median wage of Adrian households, almost $34,000, compared to a national average of $59,000; and a poverty rate of 27 percent compared to a national average of 14 percent. But, Sister Sharon said, people in the community also identified a number of challenges: the lack of accessibility to mental health services, reliable public transportation, food security, jobs with living wages, services for youth, affordable and accessible day care, and affordable housing. 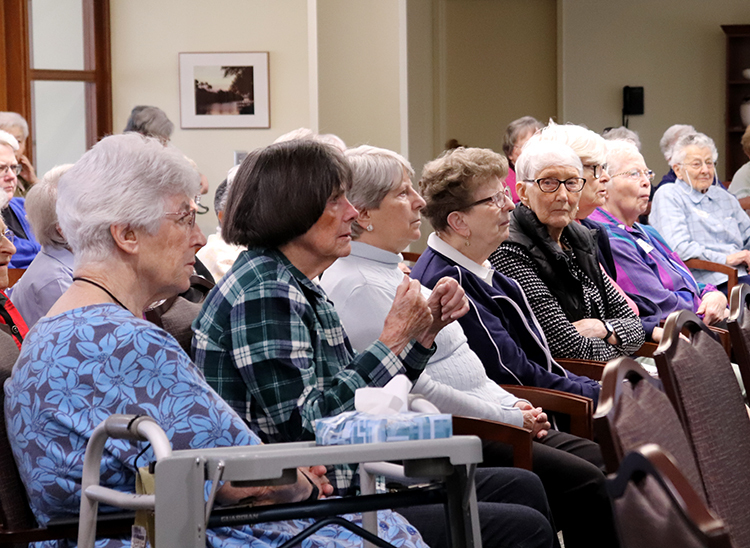 Sisters and Associates crowded the Rose Room in the Dominican Life Center to listen to an update on the work of the Adrian Resilient Communities Committee. To continue listening, especially to those living on the margins. To engage with the County Collective Impact Core Committee, a coalition of five community service organizations that meet monthly and focus on areas of benefit to the county, from health and financial stability to employment and education. To identify and engage with possible partners in the area. 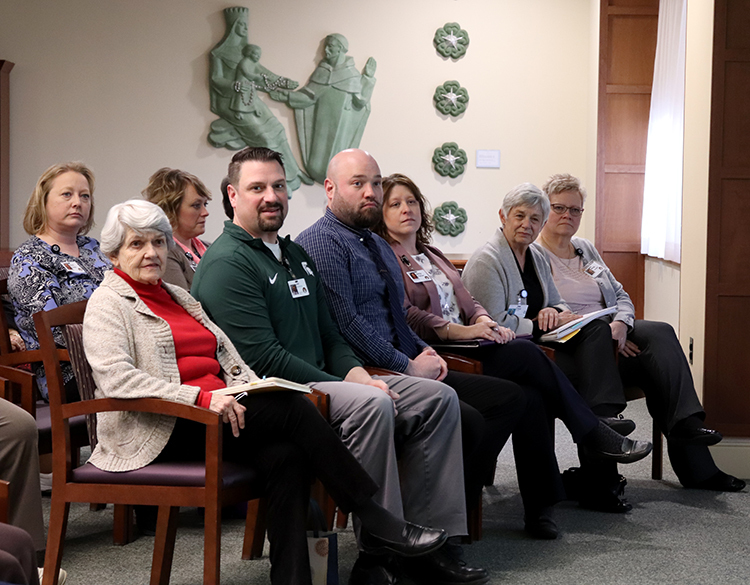 Serving on the Adrian Resilient Communities Committee are Sister Rosemary Abramovich, OP, Sister Maurine Barzantni, OP, Joel Henricks, Ashley LaVigne, Brad McCullar, Sister Pam Millenbach, OP, Amy Palmer, and Sister Kathleen Schanz, OP. Associate Dee Joyner, Director of the Office of Resilient Communities, and Sara Stoddard, Finance Director, are members ex officio, and Kris Cooper, executive assistant, serves as the Committee’s secretary. January 31, 2019, Washington, D.C. – Adrian Dominican Sisters joined thousands of other women across the United States in the 2019 Women’s March, participating in the main march in Washington, D.C., and in sister marches in other parts of the U.S. Among the participants were Sisters Maurine Barzantni, OP, Joan Baustian, OP, Leonor Esnard, OP, and Kathleen Nolan, OP, who participated in the March in Washington, D.C., and Sisters Marian Castelluccio, OP, Corinne Florek, OP, and Evelyn Montez, OP, who marched in Oakland, California. Sister Kathleen, Director of the Congregation’s Office of Justice, Peace and Integrity of Creation, coordinated the efforts of the Adrian-based Sisters who attended the march in Washington, D.C. She said traveling together and sharing the experience was a benefit. The Sisters drove 10 hours and stayed at a hotel in McLean, Virginia. They then traveled to the march with the aid of the hotel’s shuttle and public transportation. The Sisters spent five hours at the rally and march. 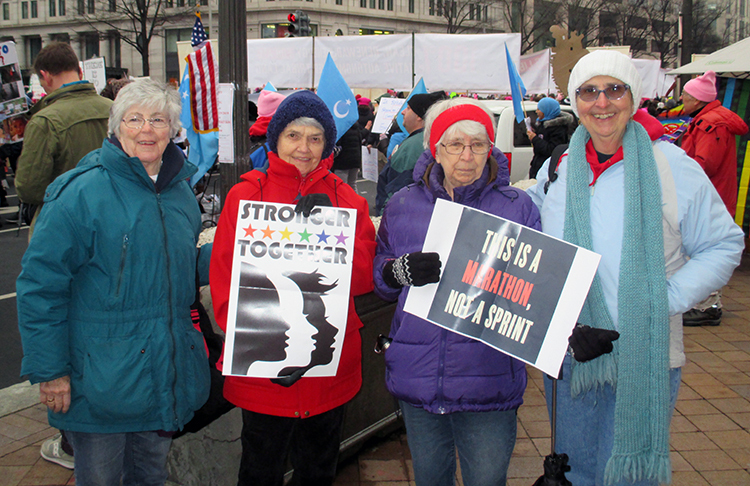 Sisters participating in the Washington Women’s March were, from left, Kathleen Nolan, OP, Maurine Barzantni, OP, Joan Baustian, OP, and Leonor Esnard, OP. Young participants in the Oakland, California, march take a break. Overall, the Sisters found the Women’s March to be inclusive and peaceful. Sister Leonor especially remembered being welcomed to the march after the Sisters disembarked from the train. “It was like a welcoming before we integrated with the group,” she said. “With all those people, everyone was polite and respectful. … You had a sense of safety and solidarity.” She was also impressed with the efforts by some to greet the police officers and military who were in attendance. “We just wanted to thank them for being there,” she said. 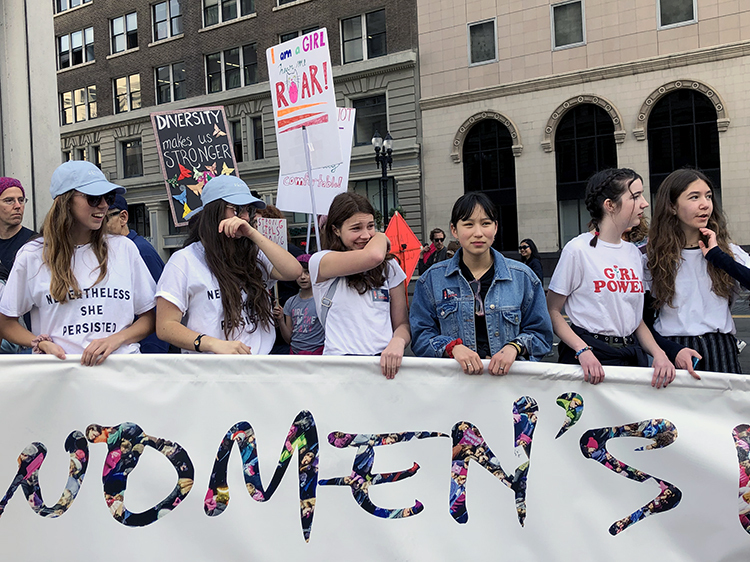 The Sisters who participated in the march in Oakland, California were also impressed by the inclusivity and diversity in the rally at Lake Merritt and the 1-mile march to the Frank Ogawa Plaza, where city offices are located. “The beauty of it was the diversity of people: families with young children in strollers, a variety of families – two moms or two dads with their kids – and diverse ethnicities and cultures,” Sister Marian said.